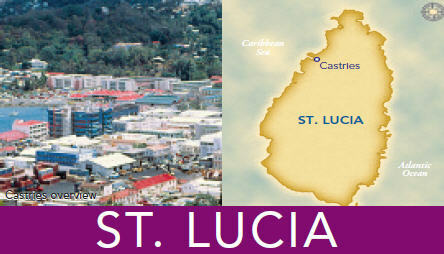 We were planning to join fellow Celebrity travelers for an excursion with Scuba St. Lucia. I had contacted them directly since they were highly recommended on th CruiseCritic message boards, but they are under contract with Celebrity when we're in port. Manager Bernd Rac had offered to bring along an instructor if we weren't certified by then, but I didn't want to miss some of the amazing dives described on Scuba St. Lucia's web site. Depart the port in air-conditioned transportation for the scenic drive through the capital city Castries, past lush banana plantations, and along the north-east coast road to the fishing village of Dennery, and then into the heart of the rainforest to Treetop Adventure Park. Upon arrival at the Welcome Centre, guests receive a safety briefing and orientation, while suiting up in the equipment provided. Experience the exhilaration of the most exciting tour in the Caribbean. Zipping through the treetops in the middle of the tropical rainforest delivers a rush that would leave even Tarzan breathless. Trained guides take you on the ride of your life. The zip line ride is a system of integrated cables and rigging designed for maximum thrill and exposure to the best views of the rainforest. Our canopy includes 10 elements consisting of 12 zip lines including the island's longest and highest, extending up to 800 feet between platforms and reaching heights up to 150 feet above the forest floor and two net bridges which travels up to 60ft long. Between zips there is plenty of time to take in the unique panoramic views and observe the magnificent flora and fauna indigenous to the forest. After the ride, relax and enjoy complimentary local refreshments while surrounded by the beauty and serenity of nature. The zip lining was great, although not nearly as frightening as I expected. Being afraid of heights, I had imagined myself struggling with some of the higher platforms and even the zips. But I had no trouble at all. It was still a rush and it was a great way to see the beautiful rain forest. At $92 per person, I thought it a bit on the expensive side. However, if you consider that Hocking Hills Canopy Tours charges $85 per person for the same number of ziplines over southeastern Ohio, it could be considered a steal (not to take anything away from my beautiful hometown area). Our transport had us back to the ship before 3pm, well in advance of the 6pm departure. We had plenty of time to clean up and rest before our 8:30 dinner seating. We hung out on our balcony for sailaway and took pictures of the beautiful full moon beaming over the ocean after sunset. I'm sure there was a glass of wine involved and probably a book for Martha. I do recall it being quite tranquil and relaxing. For details and pictures from our previous trip to St. Lucia, see our 2008 site. We were considering the following excursions when we did this cruise with Princess, but we ended up going with Serenity Vacations & Tours We had a fantastic time! We shared the private tour (and spread the costs) with the Lloyds and a couple that I met on the CruiseCritic message boards. Our ambassador Yola took great care of us. Definitely check out the pics from our trip. The boat dives should also not be missed - dramatic walls beneath the majestic Piton Mountains, Superman's flight, a drift dive in the shadow of the Petit Piton, Coral Gardens and Jalousie under the Gros Piton, Piton Wall, the wreck of the "Lesleen M", Anse La Raye and Anse Cochon. Closer to home for the afternoon boat trips but no less spectacular sites, the diver can explore Fairyland, Turtle Reef, Grand Caille, Trou Diable, the Pinnacles and much more. After a quick shuttle from dockside to your dive boat, you will depart on your underwater adventure. The dive locations will be dependent upon the weather in order to ensure maximum visibility. The growing abundance of tropical fish and the natural beauty of the reefs make diving in St. Lucia a memorable experience. This dive package includes two dives, a 3-course buffet lunch at the Anse Chastanet Hotel and use of the beach lounge chairs. This is an experience certified divers won't want to miss. Note: This tour will be enjoyed at the multi-sport, family destination of Jungle Reef Adventures. Tank and weights are included for all divers. Wetsuit is not included.